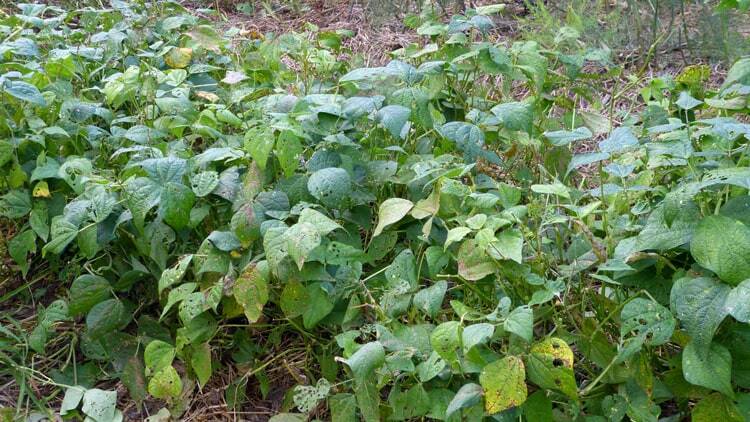 Bean Diseases – (Vegetable Diseases in General) – What’s the Best Course of Action? This year I have more beans in my garden than ever. Along with the opportunity for more beans, more diversity, and a greater chance for success — comes more of a possibility for common diseases that attack beans. That’s one of the reasons that I usually test grow a small amount of a vegetable before I grow a lot of it. That way — should problems arise — I can deal with it on small scale to see if I even want to deal with it on a larger scale. Until last week all the beans looked green and lush and free from any potential problem. The plantings that are heavy with beans (I succession plant beans numerous times) are starting to show signs of what I think are two common bacterial diseases. The good side of that is: my beans were in the peak of health while they were developing beans and therefore, this small decline in their health should not effect the amount of harvest by more than a bean or two. Many blights are favored by high temperature and humidity. Others are favored by cool temperatures and heavy rain. Some diseases appear rapidly when temperatures range from 60 to 80. Other forms appear when temperatures and humidity are high. There’s not much we can do about weather conditions. But we still have a big advantage over conventional gardeners because we’ve worked with nature and many things are already in place to help control the outbreak of these diseases. If you’ve checked out bean diseases you know there are lots of them. But if you’re an organic gardener who has been working with nature a few years, have applied her principles, and have consistently improved your soil through the addition of organic material —- you’ve also discovered that you don’t have and never will have the vast majority of those diseases. Things that increase the chances of disease are corrected automatically when working with nature. Because of your efforts to improve your soil you have beds that don’t remain sopping wet but drain well. Not only does it drain well, but roots of the plants to go deep because the soil is not compacted — giving plants a much better chance at health. And because you know to rotate your crops rather than plant the same things in the same place all the time — it’s less likely that these specialized bacterias (or fungi) will remain alive in the soil long enough to attack your next planting of beans. 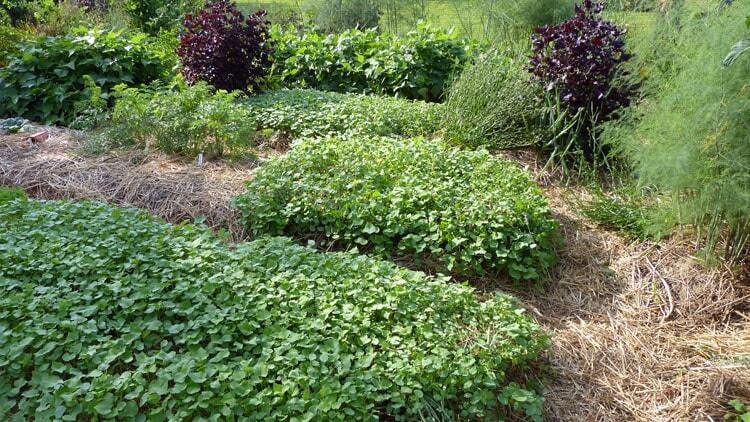 Your mulched pathways and beds have prevented splashing soil and disease spores up onto the plants. You’ve already planned for good air-circulation and proper sunlight — two of natures biggest hindrances to disease. Due to the constant addition of organic material you have a large thriving diversity of soil life to help your crops fight disease. This picture was taken in early August. 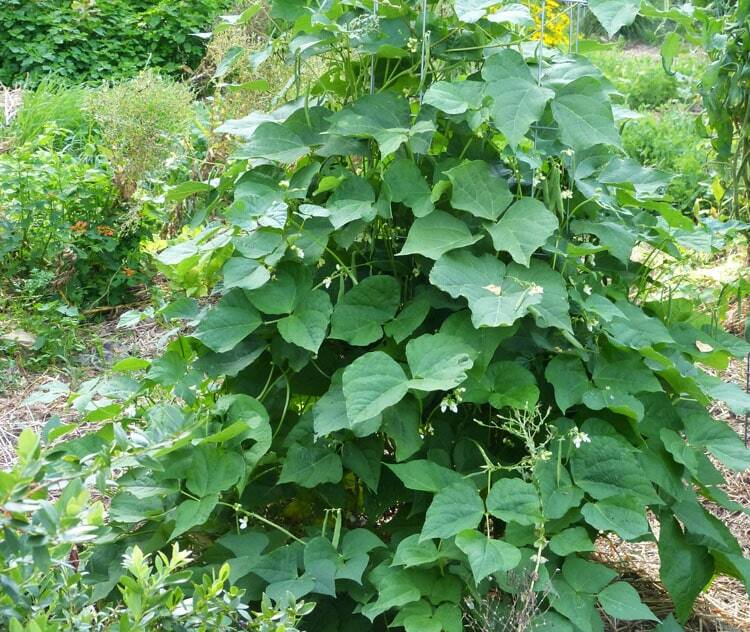 The Provider snap beans at the top center have been in the garden since June. The ones at the top left are one of the small patches of pinto beans that I’m testing this year. These are the same Provider snap beans shown at the top of the picture above this one, but on August 30th. They’ve been in the garden since early June and I’m still picking every other day. I don’t feel too badly about their having a few blighted leaves. 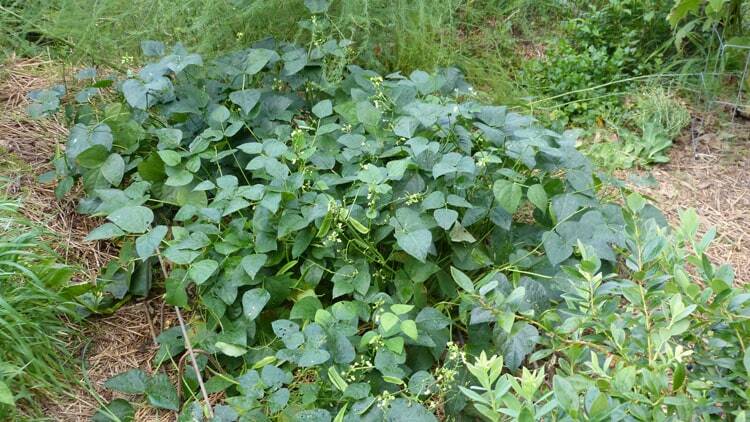 These is the same test patch of pinto beans shown at the top left of the first picture above, but on August 30th. These beans are heavy with full pods and are just starting to show problems on the leaves. Prevention is the best control of ANY disease. Here are other things that we can do to help prevent disease from destroying our harvest of beans. 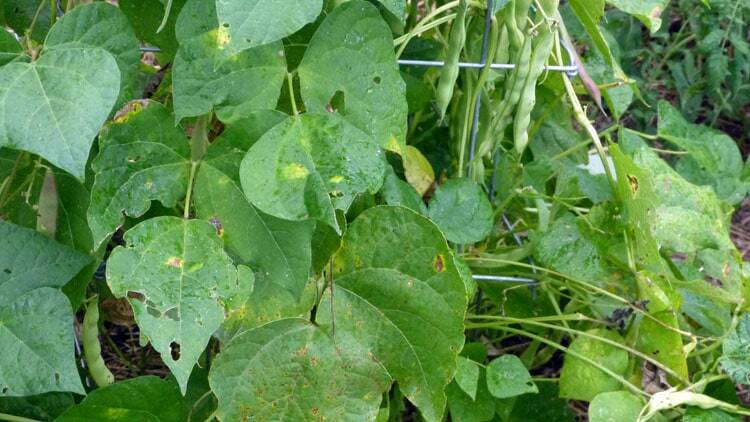 Get ’em up and growing quickly –If bean seed stays in the ground too long — especially in cold weather — there is a better chance to court disease. Plant seeds about one inch deep once soil temperatures are above 65 degrees F – so the beans can get out of the soil quickly. 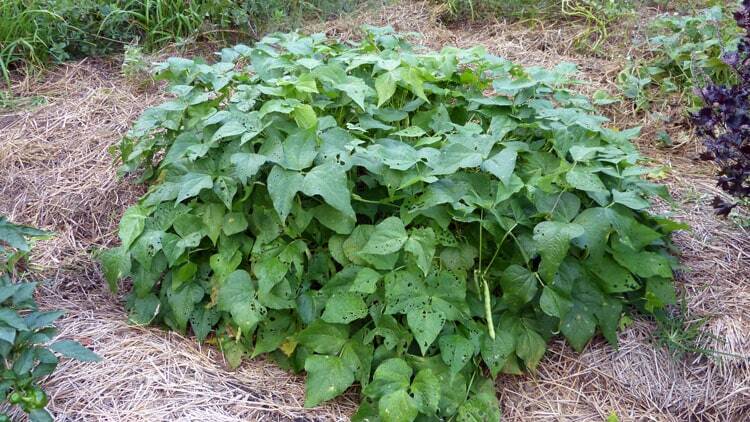 Many pathogens of bean diseases survive best in diseased residue left on the soil surface. (Anything left on top of the soil decomposes more slowly than material incorporated into the soil.) Either remove and trash the residue of diseased beans OR thoroughly bury the residue in the soil to promote their quick decay. Once the residue decays the bacteria are unable to survive. Some bacteria (like brown spot) can survive on the bean seed. This is good reason to buy only certified seed. I would recommend being very careful if you’re trading seed with someone. If they’re having a problem with any bean disease — it could be that you end up with it. I’m testing two kinds of beans to use as dried beans for winter: Taylor Dwarf Horticultural Shell Bean and Agate Pinto Bean. I’m having more disease problem with one than the other (can’t find my marker – so can’t tell you which one). If I have as much or more problem with these beans when planting from my seed next year —- I’ll never plant them again. Some varieties are more susceptible to bacterial or fungal diseases than others. When you can choose varieties with tolerance and resistance to diseases in your area do so. If you grow a variety and have a lot of trouble with it — it might be time to look for another variety. Diseases can be spread very easily when the garden is wet. Stay out of it if you can — or at least away from vegetables like beans and tomatoes that are prone to these bacterial and fungal diseases. Keep your tools and equipment clean because they can spread the pathogens also. Wipe them down with a 10% solution of bleach and water. One of my test patches of pinto beans in early August. The same beans as in the picture above this one but on August 30th. Shown are signs of one of the blights common to beans. They are loaded with almost mature beans. If I had a sheltered place to hang these beans, I’d be temped to pull them up and hang them by the roots to finish maturing. That way I could keep more of the infected residue out of the garden. Some folks use copper sprays that are OMRI approved for use in organic gardens for the fungal diseases. Copper is dangerous and I don’t use it, because I’m not interested in exchanging one dangerous chemical for another even if it is approved for organic gardens. Safer Brand has a Garden Fungicide with sulfur. I’ve never used it. Mainly because it’s just something else to buy and something else to do. But I would consider using it in some cases. These were the first of 4 plantings of Henderson lima beans and on August 30 they are showing very little rust or yellowing of leaves. They are loaded with limas and we’ve already had two meals from them. In my early years of gardening I wasted lots of time trying to pinpoint the exact name for this or that spot on a leaf. I think most gardeners in this day and age feel the urge to do that. But I refuse to allow myself to give into that. I take an approach to disease that I feel is a much more constructive approach and better use of time. When you consider the information I’ve outlined above and realize that a relatively small number of conditions set the parameter for the causes (and spread) of all of the many diseases possible, you might agree that your time will be best used in working towards preventing the diseases next year — rather than worrying about the exact name of this year’s problem. This surprises me, No beans I’ve ever grown – in very many years – have been affected by disease. I think it must be a local problem, local to USA that it. Beans of all kinds in UK seem to be the most reliable and disease-free crop possible. That is, except for broad beans which I don’t grow because I’m paranoid about black fly. I’ve just pulled out a row of flowering nasturtiums because they were black with the things and sticky with honedew. Ugh! That’s a pest rather than a disease though, there’s a fine line between them I suppose, and pests can be vectors of pathogens. I always begin my beans in pots. There’s an adage in England about sowing directly into the ground: Sow four in each spot, one for the mouse and one for the crow, one to rot and one to grow. It’s interesting to learn how different things are there Mary. How can I post pictures with my comments? Tee Jay — I’m not a “techy”. I don’t think that you can post picture with your comments. However — if you want me to see the picture — just attach it to an email and send to me at theresa@tendingmygarden.com. If I ever find that it’s possible to post a picture — I’ll post it here for you — although after the fact. Good info Theresa, my beans did the same. I just let them be and harvested and still have more to harvest. Thanks for letting me know I was not the only one. It’s always nice to know we’re not alone Alice. The harvest is fabulous this year. Hope yours is the same. Thanks for this interesting post. Friday, when pulling some of my beans to clear an area for a fall garden, I noticed that roots from some bean plants were coated with a very small white insect – some sort of mite? They were maybe half a mm long and just barely visible with the naked eye. They started to move slightly when the roots were exposed to light. The beans themselves were fairly healthy (just a little bit of blight) and gave a good crop. Nevertheless, it’s always good to be aware of potential problems – any idea what these are? The larvae of bean leaf beetles are white up to 1/3″ long and feed on roots and underground stems but that seems too big to be yours. If that were in my garden I immediately would have an uncomfortable feeling about it. I think I might bag up those bugs, put in the hot sun, and then take to the trash. As you said — it’s always good to be aware of potential problems. Mary Fisher from the UK was correct that organic gardeners in NW-Europe don’t have severe problems with any type of blight on their bean plants. However, our scourge is the bean fly, that lays its eggs as soon as we place a bean seed in the earth. That’s why Mary starts her beans in pots, which is quite a strenuous task. My pole beans are wonderful this year, and I have enough for a meal every two days. I use to plant 100-120 plants each year, but it’s much less stress to just have a few plants. This is the salient lesson I’ve learned from Theresa’s blogs. Your post was most interesting Millard. Glad that the information I provide could be of help in taking some of the stress out of growing beans. P.S. When you have a minute — I’d be interested in how many beans you planted this year. When I tested the pinto beans this year I planted about 24 beans of each. Production is really good. Millard – I’ve never HEARD of bean fly, nobody I know has ever mentioned it. It certainly isn’t why I start beans in pots, I do that out of idleness. I start ALL my crops in pots, it’s far easier than bending over the ground and marking the spots and I know that there’s only one seed per pot so there’s no wastage. I thoroughly enjoy sowing seeds in pots, it’s done in the greenhouse – and of course there is a germination headstart over outdoor sown seeds. I do wish people wouldn’t assume that they know my intention in a matter when it hasn’t been stated. Hello Theresa,love the post. Last night I found early blight on my tomatoes. I’m in California so the weather has been in the warm low 80’s with cool evenings and moist mornings. I cleared out the most infected parts of the vines that I could find (which wasn’t too much and am hoping that the new tomatoes that are coming up will make it. Rachel — the answers to your questions would depend on how many beans you’re growing and what you really want to do. I’ll tell you what I’m doing and you can see what I mean. This is my first year for growing dried beans. Oh — I just reread your questions — and want to clarify that I am not storing any of these particular beans frozen. Only dried for winter use — and then a few to plant next year. To really have lots of dried beans to store — you’d have to plant lots. I’m not going to do that — Just want enough on hand to have something that is stored dried and can be eaten in case of an emergency etc. If I’ve not been clear — just ask again. I don’t deliberately leave beans to grow fat in the pods but I simply miss a lot – far too many for next year’s sowing. They’re very good dried, just left in the pod until it’s very crisp then shelled out. I don’t freeze them like that either, no need to. As long as they’re thoroughly dry they’ll store well in the pantry.